The Emergency Economic Stabilization Act of 2008 (Division A of Pub.L. 110–343, 122 Stat. 3765, enacted October 3, 2008), commonly referred to as a bailout of the U.S. financial system, is a law enacted in response to the subprime mortgage crisis authorizing the United States Secretary of the Treasury to spend up to $700 billion to purchase distressed assets, especially mortgage-backed securities, and supply cash directly to banks. The funds for purchase of distressed assets were mostly redirected to inject capital into banks and other financial institutions while the Treasury continued to examine the usefulness of targeted asset purchases. Both foreign and domestic banks are included in the program. The Act was proposed by Treasury Secretary Henry Paulson during the global financial crisis of 2008 and signed into law by President George W. Bush on October 3, 2008. On October 1, 2008, the Senate debated and voted on an amendment to H.R. 1424, which substituted a newly revised version of the Emergency Economic Stabilization Act of 2008 for the language of H.R. 1424. The Senate accepted the amendment and passed the entire amended bill, voting 74–25. Additional unrelated provisions added an estimated $150 billion to the cost of the package and increased the length of the bill to 451 pages. (See Public Law 110-343 for details on the added provisions.) The amended version of H.R. 1424 was sent to the House for consideration, and on October 3, the House voted 263–171 to enact the bill into law. President George W. Bush signed the bill into law within hours of its congressional enactment, creating the $700 billion Troubled Asset Relief Program (TARP) to purchase failing bank assets. TARP was dwarfed by other guarantees and lending limits; analysis by Bloomberg found the Federal Reserve had, by March 2009, committed $7.77 trillion to rescuing the financial system, more than half the value of everything produced in the U.S. that year. The maximum cost of a $700 billion bailout would be $2,295 estimated cost per American (based on an estimate of 305 million Americans), or $4,635 per working American (based on an estimate of 151 million in the work force). The bulk of this money would be spent to purchase mortgage backed securities, ultimately backed by American homeowners, which possibly could be sold later at a profit, by the government. Economist Michael Hudson predicts that the bailout would cause hyperinflation and dollar collapse. Skepticism regarding the plan occurred early on in the House. Many members of Congress, including the House of Representatives, did not support the plan initially, mainly conservative free-market Republicans and liberal anti-corporate Democrats. Alabama Republican Spencer Bachus has called the proposal "a gun to our head" fear-inflicting policy of the administration to stifle proper debate and affect decision. However, many sources have reported that for this crisis there are many alternatives and options, and other less risky and more profitable solutions to use the taxpayers' funds that aren't being debated, but ought to be debated, in the rush to the sudden deal. There was concern that the current plan created a conflict of interest for Paulson. Paulson was a former CEO of Goldman Sachs, which stood to benefit from the bailout. Paulson had hired Goldman executives as advisors and Paulson's former advisors had joined banks that were also to benefit from the bailout. Furthermore, the original proposal exempted Paulson from judicial oversight. Thus there was concern that former illegal activity by a financial institution or its executives might be hidden. In a Wall Street Journal opinion piece, Senator Hillary Clinton advocated addressing the rate of mortgage defaults and foreclosures that ignited this crisis, not just bailing out Wall Street firms: "If we do not take action to address the crisis facing borrowers, we'll never solve the crisis facing lenders." She has proposed a new Home Owners' Loan Corporation (HOLC), similar to that used after the Depression, which was launched in 1933. The new HOLC would administer a national program to help homeowners refinance their mortgages. She also called for a moratorium on foreclosures and freezing of rate hikes in adjustable rate mortgages. Barack Obama, then the Democratic presidential candidate, said that any bailout must include plans to recover the money, protect working families and big financial institutions and be crafted to prevent such a crisis from happening again. Investor George Soros opposed the original Paulson plan: "Mr Paulson's proposal to purchase distressed mortgage-related securities poses a classic problem of asymmetric information. The securities are hard to value but the sellers know more about them than the buyer: in any auction process the Treasury would end up with the dregs. The proposal is also rife with latent conflict of interest issues. Unless the Treasury overpays for the securities, the scheme would not bring relief." – but calls Barack Obama's list of conditions for the plan "the right principles". Nobel Prize-winning economist Joseph Stiglitz strongly criticizes the bill in an article written for The Nation. Journalist Rosalind Resnick favors a hypothetical scenario in which "consumers and businesses would be able to borrow at the fed funds rate at 2 percent, just like the big banks do. This means that every cash-strapped homeowner would be able to refinance his mortgage and cut his payments in half, saving thousands of homes from foreclosure. Consumers could also refinance their credit card balances, auto loans and other debt at interest rates they can afford" and that this plan "would cost U.S. taxpayers absolutely nothing." Journalist James McFadden (SPP) associated Mr. Paulson's plan as a "direct infringement of the constitution" but also stated that it was a doubled edged sword scenario, which "had to be done." Arnold Kling, a former senior economist at Freddie Mac, defines "home borrowers" as "people who are nominally owners but who put down so little money for their purchase that they are better described as living in borrowed homes." He thinks the plan should be to replace home borrowing with renting or home ownership. Investor Warren Buffett believes the government should pay market price for the assets rather than an artificially high hold-to-maturity price. The market price would be determined by selling a portion of the assets to private investors. Some of the letters published in the September 27 Denver Post suggest taking similar steps to reduce the taxpayers' risk and commitment. Following the House vote, the Dow Jones Industrial Average dropped over 777 points in a single day, its largest single-day point drop ever. The $1.2 trillion loss in market value received much media attention, although it still does not rank among the index's ten largest drops in percentage terms. The S & P lost 8.8%, its seventh worst day in percentage terms and its worst day since Black Monday in 1987. The NASDAQ composite also had its worst day since Black Monday, losing 9.1% in its third worst day ever. The TED spread, the difference between what banks charge each other for a three-month loan and what the Treasury charges, hit a 26-year high of 3.58%; a higher rate for inter bank loans than Treasury loans is a sign that banks fear that their fellow banks won't be able to pay off their debts. Meanwhile, the price of U.S. light crude oil for November delivery fell $10.52 to $96.37 a barrel, its second largest one-day drop ever, on expectations of an economic slowdown reducing oil consumption and demand. The Dow Jones industrial average recovered 485 points or about 62% of the entire loss the very next day. See also the Senate CBHUA web page The amendment was approved by a 74–25 vote, and the entire bill was also passed by the same margin, 74–25 (R: 34-14, D: 41-11, including Lieberman and Sanders). Only cancer-stricken Senator Ted Kennedy did not vote. Under the legislative rule for the bill, sixty votes were required to approve the amendment and the bill. A House leader accused the Senate of legislating "by blunt force" without public consent. ↑ Andrew Clark (November 13, 2008). "Paulson abandons plans to buy up America's toxic mortgage assets". The Guardian. London. Retrieved November 15, 2008. ↑ David Lawder (November 12, 2008). "U.S. backs away from plan to buy bad assets". Reuters. Retrieved November 15, 2008. ↑ Andrew Ross Sorkin. Too Big to Fail. Penguin Books, 2009, 2010. pp. 83–93. 1 2 The bill as voted on September 29, 2008 was an amendment substituting the text of the "Emergency Economic Stabilization Act of 2008": into H.R. 3997, a bill with an entirely different legislative history. Amendment to the Senate Amendment to H.R. 3997 House Committee on Financial Services (retrieved September 30, 2008). See also the committee's press release links: Emergency Economic Stabilization Act of 2008. ↑ "Final vote results for roll call 674". Clerk of the United States House of Representatives. September 29, 2008. Retrieved September 29, 2008. ↑ Final Roll Call for Senate vote: On Passage of the Bill (H. R. 1424 As Amended). 1 2 3 Hulse, Carl; David M. Herszenhorn (October 1, 2008). "Adding Sweeteners, Senate Passes Bailout Plan". The New York times. Retrieved October 1, 2008. ↑ "Senate passes its own bank bailout package". msnbc.com. October 1, 2008. ↑ "Final Vote Results for Roll Call 681". Clerk of the United States House of Representatives. October 3, 2008. Retrieved October 21, 2008. 1 2 Herszenhorn, David M. (October 3, 2008). "House Approves Bailout on Second Try". The New York Times. Retrieved October 3, 2008. ↑ Temple-Raston, Dina (October 3, 2008). "Bush signs $700 billion bailout bill". NPR. ↑ Ivry, Bob; Keoun, Bradley; Kuntz, Phil (November 28, 2011). "Secret Fed Loans Gave Banks $13 Billion Undisclosed to Congress". Bloomberg Markets Magazine. Bloomberg L.P. Retrieved May 14, 2012. ↑ McManus, Doyle (September 24, 2008). "Americans reluctant to fund bailout". Los Angeles Times. Retrieved September 28, 2008. ↑ Roubini, Nouriel (September 29, 2008). "History shows the bail-out won't solve the banking crisis". The Guardian. London. Retrieved October 2, 2008. ↑ Soraghan, Mike (October 1, 2008). "Senate adds renewable energy credits to bailout". San Jose Business Journal. Bizjournals.com. Retrieved October 2, 2008. ↑ "Banks in Miser Mode"
↑ Bel Bruno, Joe & Paradis, Tim (October 6, 2008). "Dow finishes below 10,000 for first time since '04". Retrieved 2008-10-07. ↑ "Asia, Pacific markets tumble in opening". CNN. October 6, 2008. Retrieved 2008-10-07. 1 2 3 4 "Text of Draft Proposal for Bailout Plan". The New York Times. September 20, 2008. ↑ "President Bush Meets with Bicameral and Bipartisan Members of Congress to Discuss Economy", Whitehouse.gov, September 25, 2008. ↑ Schwartz, Nelson D.; Dougherty, Carter (September 22, 2008). "Foreign Banks Hope Bailout Will Be Global". The New York Times. ↑ Landler, Mark; Myers, Steven Lee (September 23, 2008). "Buyout Plan for Wall Street Is a Hard Sell on Capitol Hill". The New York Times. ↑ "President's Address to the Nation", September 24, 2008. ↑ McCain, Obama Issue Joint Statement on Crisis Fox News, September 24, 2008, Retrieved on October 8, 2008. ↑ "Blueprint for a Modernized Financial Regulatory Structure" , United States Department of the Treasury, March 31, 2008. ↑ Calabresi, Massimo (September 23, 2008). "Congress and the Bailout Plan: Business As Usual". Time. ↑ Thompson, Mark. "7 Questions About the $700 Billion Bailout", Time, September 24, 2008. ↑ Luhby, Tami (September 24, 2008). "Congress Advances on Bailout Deal", CNNMoney.com. ↑ Keoun, Bradley. "Merrill Sells $8.55 Billion of Stock, Unloads CDOs", Bloomberg.com, July 29, 2008. ↑ Solomon, Deborah (February 11, 2009). "Market Pans Bank Rescue Plan". The Wall Street Journal. Retrieved February 12, 2009. ↑ = February 15, 2009 "Meredith Whitney: A Bad Bank Won't Save Banks" Check |url= value (help). businessinsider.com. January 29, 2009. ↑ "The Put Problem with Buying Toxic Assets". SSRN.com. February 14, 2009. Retrieved February 15, 2009. ↑ Christie, Les. "Housing relief efforts slow as pace of foreclosures rise", CNNMoney.com, April 28, 2008. ↑ "How Much The Government's $700B Bailout Plan Will Cost You", Associated Press and NBC6.net, September 26, 2008. ↑ "Bush bailout will cause hyperinflation". Daily Newscaster. September 26, 2008. Retrieved September 30, 2008. ↑ Alicia Wallace. CU economist: U.S. financial system reaching 'tipping point'. September 25, 2008. Retrieved 2008-10-06. ↑ UBS. Finis. Daily roundup for September 20, 2008. Retrieved 2008-10-12. "Liquidity injections are not inflationary, because there is no excess money supply - injections are meeting excess demands." ... "Anyone out there who still considers that stagflation is a viable outcome should stop taking the hallucinogenic drugs." ↑ UBS AG. Good news (banking) bad news (real world). Daily roundup for October 2, 2008. Retrieved 2008-10-12. "softening prices (disinflation)" ... "this is a disinflationary to deflationary environment. We await written apologies ... from those who were so assiduous in asserting stagflation fears in the face of economic good sense." ↑ UBS. There is no alternative. "Policy measures are anti-deflationary. They are not inflationary." Daily roundup for October 7, 2008. Retrieved 2008-10-12. ↑ Sudeep Reddy (September 28, 2008). "The Real Costs of the Bailouts". The Wall Street Journal. Retrieved September 30, 2008. ↑ (Press Release) Testimony by Secretary Henry M. Paulson, Jr. before the Senate Banking Committee, United States Department of the Treasury, September 23, 2008. ↑ Chairman Ben S. Bernanke Before the Committee on Banking, Housing, and Urban Affairs, U.S. Senate, Federal Reserve System, September 23, 2008. ↑ "25 Harshest Reactions to the Wall Street Bailout". Retrieved November 16, 2008. ↑ Kevin Drawbaugh (September 27, 2008). "Bailout push is fueled by market fears, pizza". Reuters. Archived from the original on October 1, 2008. Retrieved September 30, 2008. 1 2 "Financial crisis and bailout: 9 letters". Blogs.denverpost.com. September 27, 2008. Retrieved September 30, 2008. ↑ Twaronite, Lisa and Levine, Deborah. "Dollar buckles under bailout's fiscal weight", MarketWatch, September 22, 2008. ↑ "Dollar slips vs yen and euro, U.S. plan in focus", The Guardian, September 22, 2008. ↑ Jacobs, Stevenson. "Oil makes biggest single-day price jump ever", Yahoo! Finance, September 22, 2008. ↑ Shenk, Mark. "Oil Posts Biggest Gain as Traders Caught in End-Month Squeeze", Bloomberg.com, September 22, 2008. ↑ Hoak, Amy. "Mortgage rates jump in wake of bailout plan", MarketWatch, September 25, 2008. ↑ Baker, Dean (October 2, 2008). "The Credit Squeeze Scare". The Huffington Post. ↑ Stein, Sam. "Paulson's Conflicts Of Interest Spark Concern", Huffington Post, September 22, 2008. ↑ Hall, Kevin G. [www.mcclatchydc.com/.../can-you-trust-a-wall-street-veteran.html "Is it safe to trust a Wall Street veteran with a Wall Street bailout? "], McClatchy, September 24, 2008. Retrieved October 17, 2012. ↑ Shenn, Jody. "Paulson Debt Plan May Benefit Mostly Goldman, Morgan", Bloomberg.com, September 22, 2008. ↑ Zajac, Andrew (February 4, 2009). "Commerce Nominee's Own Finances Have Suffered". Chicago Tribune. ↑ Schubert, Elizabeth. "Rochester Protest Against Bailout One of Many Across Country", ABC 13Wham, Rochester, New York, September 26, 2008. ↑ Wiessner, Christian (September 25, 2008). "Labor unions protest in New York against bailout". Reuters. Retrieved September 26, 2008. 1 2 "Public isn't buying Wall Street bailout", Los Angeles Times, September 26, 2008. ↑ Rooney, Ben (September 25, 2008). "Bailout foes hold day of protests". CNN. Retrieved September 26, 2008. ↑ "Kill Wall Street dot com — (BETA)". ↑ 57% of Public Favors Wall Street Bailout, Pew Research Center, September 23, 2008. ↑ Benjamin, Matthew. "Americans Oppose Bailouts, Favor Obama to Handle Market Crisis". Bloomberg.com. September 24, 2008. Retrieved September 25, 2008. ↑ Goldman, Julianna and Chen, Edwin. "Obama, McCain Say Government Must Recoup Bailout Cost (Update1)", Bloomberg.com, September 24, 2008. Retrieved September 25, 2008. ↑ Newport, Frank. "Americans Favor Congressional Action on Crisis", The Gallup Organization, September 26, 2008. ↑ Constituents Make Their Bailout Views Known, The New York Times, September 25, 2008. Retrieved September 25, 2008. ↑ Ahrens, Frank. "Senate Goes After Regulators Past, Present", The Washington Post, September 23, 2008. ↑ Patrick Yoest. UPDATE:Shelby:Treasury Proposal 'Neither Workable Nor Comprehensive', Dow Jones Newswires. September 22, 2008. Retrieved September 25, 2008. ↑ Mullins, Luke. "Sen. Jim Bunning: The Bailout Is Un-American", U.S. News & World Report, September 23, 2008. ↑ Paul, Ron. "Commentary: Bailouts will lead to rough economic ride", CNN, September 23, 2008. ↑ Barr: "bailout from hell"
1 2 Clinton, Hillary Rodham. Let's Keep People In Their Homes, The Wall Street Journal, September 25, 2008. 1 2 Jagger, Suzy. "Henry Paulson hailed as a hero for stemming market slide, but all are not convinced", The Times, September 20, 2008. ↑ "CNBC INTERVIEW TRANSCRIPT & VIDEO, Part 1: Warren Buffett Explains His $5B Goldman Investment", CNBC, September 24, 2008. ↑ Soros, George. "Paulson cannot be allowed a blank cheque", Financial Times, September 24, 2008. ↑ Dorfman, Dan. "For, Against Uncle Sam's Bailout", The New York Sun, September 22, 2008. ↑ Stiglitz, Joseph. "A Better Bailout", The Nation, September 26, 2008. 1 2 Krugman, Paul. Cash for Trash, The New York Times, September 21, 2008. 1 2 Krugman, Paul (September 28, 2008). "The good, the bad, and the ugly". The New York Times. Retrieved October 1, 2008. 1 2 "Common (Stock) Sense about Risk-Shifting and Bank Bailouts". SSRN.com. December 29, 2009. Retrieved January 21, 2009. 1 2 "Debt Overhang and Bank Bailouts". SSRN.com. February 2, 2009. Retrieved February 2, 2009. ↑ Fratianni, Michele; Francesco Marchionne (2009). "Rescuing Banks from the Effects of the Financial Crisis" (PDF). SSRN Working Paper. ↑ America's bail-out plan: I want your money, The Economist, September 25, 2008. ↑ Kuttner, Robert (September 22, 2008). "Paulson's Folly". The American Prospect. Retrieved September 23, 2008. ↑ Resnick, Rosalind. Memo to Uncle Sam: Small Business Needs Your Help, Too!, Entrepreneur.com, September 22, 2008. ↑ Michael Hudson (September 22, 2008). "The Paulson-Bernanke Bank Bailout: Will the Cure be Worse than the Disease?". Global Research. Retrieved September 30, 2008. ↑ Drawbaugh, Kevin (September 25, 2008). "Conservative Republicans offer bailout alternative". Reuters. Retrieved September 30, 2008. ↑ Sunnucks, Mike. "McCain may back alternative to bank bailout", Phoenix Business Journal, September 25, 2008. ↑ "The Case Against the Bailout". September 25, 2008. Retrieved September 30, 2008. ↑ Schoen, John W. (October 2, 2008). "Economists say rescue plan still needs work". msnbc.com. Retrieved October 2, 2008. ↑ "Jonathan GS Koppell". Retrieved October 2, 2008. ↑ "HOME (Home Owners' Mortgage Enterprise): A 10 Step Plan to Resolve the Financial Crisis". September 24, 2008. Retrieved September 30, 2008. ↑ "Why Paulson is Wrong". September 21, 2008. Retrieved September 30, 2008. ↑ Tavakoli, Janet (September 25, 2008). "Specific Proposed Alternative to (the Various Versions) of the Paulson Plan". Retrieved September 30, 2008. ↑ Tavakoli, Janet (September 29, 2008). "An alternative to the Paulson plan – one that does not violate the spirit of democracy". Financial Times. Retrieved September 30, 2008. ↑ Mark Klein (September 26, 2008). "Former Merrill Banker Suggests Bailout Alternative - Mergers, Acquisitions, Venture Capital, Hedge Funds". The New York Times. Retrieved September 30, 2008. ↑ Blodget, Henry (September 24, 2008). "Warren Buffett Reveals Bailout's Dirty Little Secret". Retrieved September 30, 2008. ↑ Strauss-Kahn, Dominique (September 22, 2008). "A Systemic Crisis Demands Systemic Solutions". Retrieved October 12, 2008. ↑ Vekshin, Alison. "Paulson, Lawmakers Narrowing Differences, Frank Says", Bloomberg.com, September 22, 2008. ↑ Rowley, James and Alison Vekshin "House Republicans Undercut Bush on Rescue, Slow Talks", Bloomberg.com, September 26, 2008. ↑ "House to meet Thursday after rejecting bailout". MSNBC.com. September 29, 2008. Retrieved September 30, 2008. ↑ "Bush hails 'extraordinary' bailout deal". MSNBC.com. September 29, 2008. Retrieved September 30, 2008. 1 2 Vekshin, Alison; Laura Litvan (September 29, 2008). "U.S. House Rejects $700 Billion Financial-Rescue Plan (Update5)". Bloomberg.com. Bloomberg LLC. Retrieved September 29, 2008. ↑ Final Vote Results for Roll Call 674 (H R 3997 Recorded Vote September 29, 2008, 2:07 PM) Clerk, United States House of Representatives. Retrieved September 30, 2008. ↑ HR3997 THOMAS, Library of Congress. (Access to legislative history; note that H.R.3997 is the vehicle for the Emergency Economic Stabilization Act of 2008. ↑ Legislative Day of September 29, 2008 110th Congress, Second Session. Clerk of the United States House of Representatives. Retrieved September 30, 2008. ↑ Hulse, Carl; David M. Herszenhorn (September 29, 2008). "House Rejects Bailout Package, 228-205; Stocks Plunge". The New York Times. Retrieved September 29, 2008. ↑ Julie Hirschfeld Davis (September 29, 2008). "Bailout bill slapped aside; record stock plunge". Yahoo! News. Associated Press. Archived from the original on October 3, 2008. Retrieved September 30, 2008. 1 2 3 Hulse, Carl; Pear, Robert (October 1, 2008). "Senate to Vote Today on the Bailout Plan". The New York Times. Retrieved October 1, 2008. ↑ "Vote Summary: Question: On the Amendment (Dodd Amdt. No. 5685 ) - In the nature of a substitute". U.S. Senate Roll Call Votes 110th Congress - 2nd Session. Secretary of the United States Senate. October 1, 2008. Retrieved October 1, 2008. ↑ "Vote Summary: On Passage of the Bill (H. R. 1424 As Amended )". U.S. Senate Roll Call Votes 110th Congress - 2nd Session. Secretary of the United States Senate. October 1, 2008. Retrieved October 1, 2008. ↑ Soraghan, Mike (October 1, 2008). "Senate adds renewable energy credits to bailout". Silicon Valley / San Jose Business Journal. ↑ NPR (October 3, 2008) Retrieved October 17, 2012. ↑ Federal Reserve Board of Governors (December 3, 2008) FRB Docket No. R-1334 - Reg. 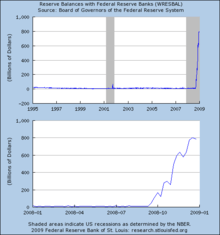 D - Public Comments on Reserve Requirements of Depository Institutions"
↑ Federal Reserve Board of Governors (December 31, 2008) "Interest on Required Reserve Balances and Excess Balances". Retrieved January 5, 2008. ↑ The Independent (November 6, 2008) "Shipping: Holed beneath the waterline"
↑ Hagenbaugh, Barbara. "Treasury given significant leeway in creating plan to buy toxic debt", USA Today, October 3, 2008. ↑ Amendment to HR 1424, Division A, Section 101. ↑ Gosselin, Peter G. "Paulson will have no peer under bailout deal", Los Angeles Times, September 29, 2008. ↑ Amendment to HR 1424, Division A, Section 115. 1 2 3 "Breakdown of the Final Bailout Bill", The Washington Post, September 28, 2008. ↑ Amendment to HR 1424, Division A, Section 113. ↑ Dvorak, Phred and Lublin, Joann S. "Bailout's Bid to Limit Executive Pay Will Be Tough to Realize", The Wall Street Journal, October 6, 2008. 1 2 Congress Passes New Limits on Executive Compensation Paid by Troubled Financial Institutions, Sonnenschein Nath & Rosenthal LLP., October 3, 2008. 1 2 Amendment to HR 1424, Division A, Section 111. ↑ Abrams, Paul. "Weak, Pathetic Executive Compensation Limitations", Huffington Post, September 29, 2008. ↑ Amendment to HR 1424, Division A, Section 109. ↑ Spangler, Todd. "Your questions answered on bailout bill", Detroit Free Press, October 1, 2008. Archived June 29, 2013, at the Wayback Machine. ↑ Andrews, Edmund L. (November 19, 2008). "Treasury Denounced Over Bailout". The New York Times. Retrieved May 1, 2010. ↑ Amendment to HR 1424, Division A, Section 119. ↑ Fitzgerald, Alison. "As 'Biggest Crisis' Hit, Congress Held Nose and Backed Bailout", Bloomberg.com, October 6, 2008. 1 2 3 Sahadi, Jeanne. "Bailout 101: What new law says", CNNMoney.com, October 4, 2008. ↑ Amendment to HR 1424, Division A, Section 104. ↑ Amendment to HR 1424, Division A, Section 125. 1 2 Sweet, Lynn. "Bailout bill 'Emergency Economic Stabilization Act of 2008' searchable summary", Chicago Sun-Times, September 28, 2008. ↑ Amendment to HR 1424, Division A, Section 116. ↑ Amendment to HR 1424, Division A, Section 121. ↑ Amendment to HR 1424 Amendment to HR 1424, Division A, Section 136. 1 2 3 4 Dash, Eric (November 1, 2008). "U.S. Said to Be Using Loose Rules in Bank Aid". The New York Times. Retrieved November 1, 2008. ↑ Benjamin, Matthew (September 24, 2008). "Paulson Plan May Push U.S. Debt to Post-WWII Levels (Update1)". Bloomberg. Retrieved October 1, 2008. ↑ McIntire, Mike. "Bailout Is a Windfall to Banks, if Not to Borrowers". The New York Times. January 17, 2009.